Google, arguably the world’s foremost authority in Internet searches, has finally unveiled its Year in Search 2014 coverage. Many events captured our collective attention this year, from the threat of Ebola to the mysterious disappearance of Malaysian Airlines flight MH370. 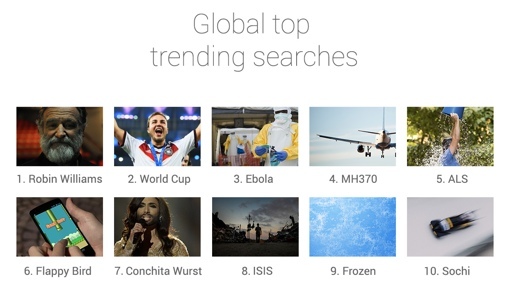 But according to Google search data, the most searched event of 2014 was the sudden loss of actor Robin Williams. According to Google, Williams’ death had a powerful ripple effect in the search world. People not only searched for information about the comedian’s life, his family and his body of work, but also shared numerous animated GIFs and other thoughts in memoriam. His death even spiked interest in mental health topics and tests for depression. Want to peruse Google’s Year in Search coverage on your own? Simply type “google 2014” into a Google search box and you’ll be able to take a look at the top lists from around the world. Those who still use the Google+ social network can also find Year in Search content by using the hashtag #YearInSearch.